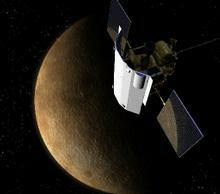 At approximately 7 p.m. MT on Thursday, March 17, after more than six-and-a-half years and a nearly 5-billion-mile journey, NASA’s MESSENGER mission became the first spacecraft to enter into orbit around the planet Mercury. LASP developed and built the Mercury Atmospheric and Surface Composition Spectrometer (MASCS) instrument onboard MESSENGER. MASCS is designed to detect minerals on Mercury’s surface, and determine the abundance and components of its thin atmosphere. For the next several weeks, engineers will be focused on ensuring that systems aboard the spacecraft are all working well in Mercury’s harsh thermal environment. Starting on March 23, the instruments will be turned on and checked, and on April 4 the primary science phase of the mission will begin, as the first orbital science data from Mercury is returned.